Another meeting arranged at short notice, and potentially our last of the year as busy familial festive schedules start to kick in. So it made sense to theme it around our albums of the year, even if we didn’t quite know how the logistics of that might work; would we vote and play our three consensus records? Pick our very favourite record each? Would we pronounce a Devon Record Club Album of the Year? Typically, we were more pragmatic and prosaic than that, and each chose a record from 2011 that we liked a lot and which at least one of the other two hadn’t heard. I went last, debating between Patrick Wolf, Destroyer, and Nicolas Jaar; I picked Jaar’s debut after a comment by Rob that there had been a lot of really good “sounding” albums this year (i.e. albums with good sound, not albums that we’re hearsay suggests are qualifiedly “good”). Jaar’s is the album that I’ve perhaps enjoyed the most on a purely phenomenological level, and when I played an isolated track from it at an earlier meeting everyone seemed impressed and intrigued. The album itself is a sensuous, aesthetic pleasure; not quite the minimal house odyssey some fans of his early singles had expected, but nevertheless immaculately constructed, captivating and unusual. 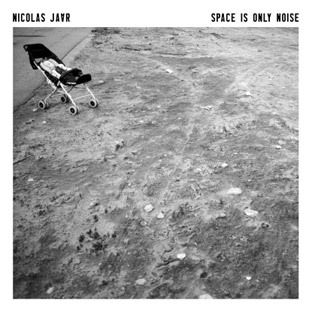 It occupies a strange nowhere land between techno and jazz and minimal and Germany and South American and east and west; the cover picture depicts Jaar himself, as an infant, in the no-man’s land between east and west Berlin. Despite being a very obviously digital construct, it’s a warm, human record, full of pianos, strings, brass, and voices as well as thrumming basslines and thumping beats. It starts incredibly abstractly, the opening trio of tracks weaving spoken words in numerous languages and found sound recordings of breaking waves through strange rhythmic patterns and irregularly intersecting waves of sound. The mid section of the record adds more focus and direct intention (while never quite becoming obvious), vocals used as hooks rather than ambience, and beats coalescing into patterns that could almost affect dancefloors, before the final three tracks disintegrate the patterns again, and bring the album neatly back to where it began. Jaar’s dad apocryphally bought a Villalobos album as inspiration for his young son’s musical development on the recommendation of a record store clerk, after asking for the most cutting edge and accomplished music out there. I’m glad he did, and I can’t wait to hear where Jaar’s strange confluence of muses takes him next. Tom Listened: This album started off really well for me but faded towards the end. I have been aware of Nicholas Jaar’s name cropping up in the occasional best of 2011 internet list and my interest was fueled when Nick played a song from the album at one of the earlier meetings. I enjoyed the album all the way through, but I did feel it lost impact as it went on and by the end it had become (very lovely) background music for me. I suspect that this would become less of an issue with repeated listens but I’m not sure we’ll ever become that well acquainted. Rob listened: It’s always a pleasure to hear Nick roll out one of his stock phrases, mainly because they tend to be much more interesting than mine. In fact, my most repeated words at Record Club meetings are, “the interesting thing is…” usually followed by something quite plain. Nick, meanwhile, tends towards interesting compounds like “phenomenologically beautiful” or, if cornered, “non-diagetic”. The interesting thing is that ‘Space Is Only Noise’ did indeed seem beautiful in cold, precisely defined terms. I could have listened to the tinkling piano accompanied by a gurgling child and what sounded like a German man attempting to master English vowel sounds for about 45 minutes, it all sounded so pretty. Like Tom, I found it palled slightly in the middle, the closer it approximated dance music, but all in all a lovely thing.